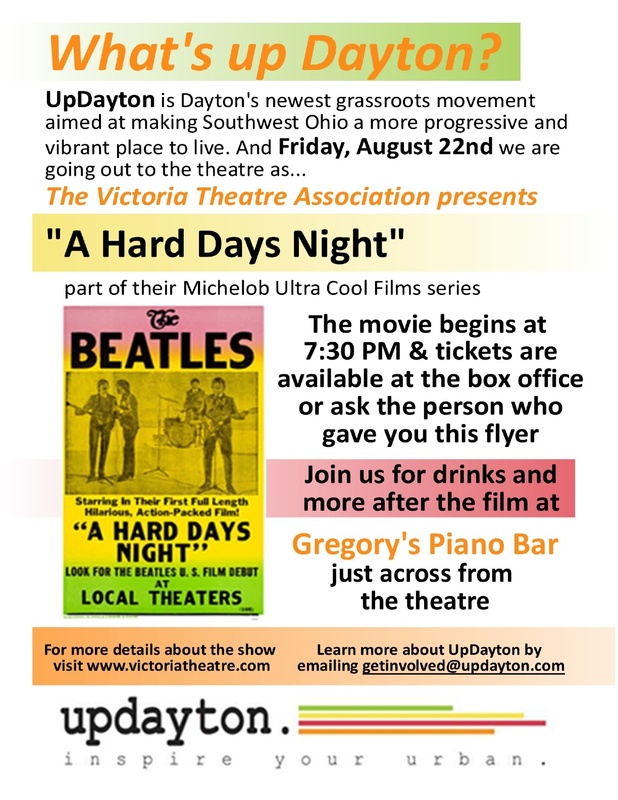 updayton has collaborated with the Victoria Theatre Association’s Michelob Ultra Cool Film Series and Gregory’s Piano Bar to host a Beatles-themed evening of entertainment and social networking for the region’s young professionals. 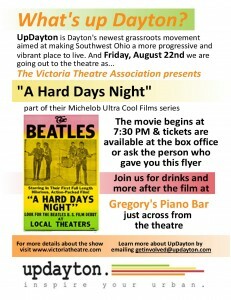 The Beatles film A Hard Day’s Night is the final presentation of the popular summer film series presented by the Victoria Theatre Association. For just $4.75, patrons can enjoy the classic Beatles film in the beautiful setting of the Victoria Theatre. updayton invites residents interested in fostering growth in the Dayton area out on opening night, Friday, August 22, to see the film at 7:30 PM. Immediately following the movie, the group will travel across Main Street to Gregory’s Piano Bar where Beatles music and Beatles-themed drink specials will continue the entertainment. updayton is committed to finding new and innovative ways for young professionals to utilize Southwest Ohio’s world-class resources. 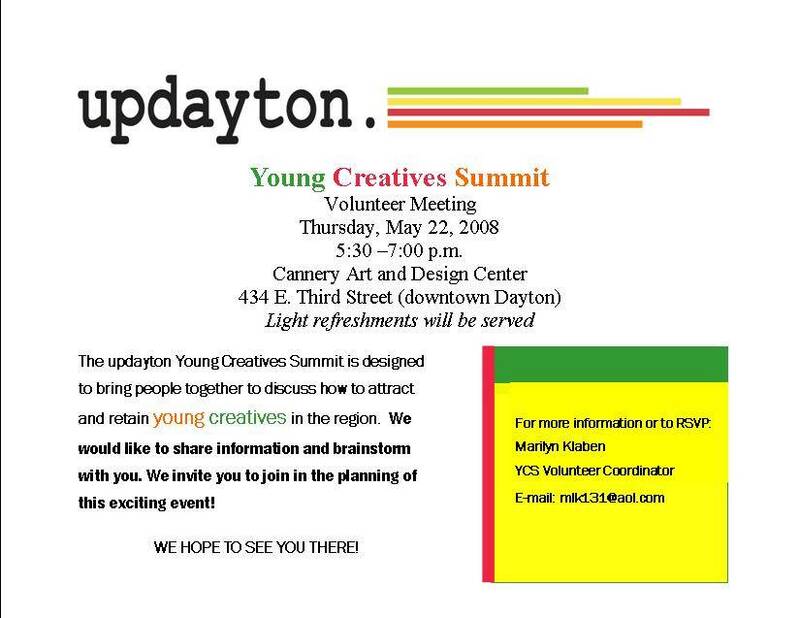 For more information on updayton and this event, view the press release. updayton has teamed with the City of Dayton to help make the second Summer in the City a success by providing local young professionals to act as mentors to college-aged students. An initiative of the City of Dayton Commission office, Summer in the City reaches out to college students to demonstrate the advantages of living and working in the area through workshops, networking, and social activities over the course of an 11-week program. The program invites young professionals in the region to act as mentors in sharing their experiences with the summer interns. updayton has provided approximately one-third of the mentors participating in this year’s Summer in the City program. updayton, a community empowerment organization, works to connect young talent to the city. updayton fights to combat the ‘brain drain’ of students coming to Dayton for an college education and then leaving the region for post-graduate employment. updayton volunteer mentors include scientists, lawyers, educators, activists, and artists; each participating member has been matched with an intern with similar professional goals. Please note; the location of the next updayton meeting has been changed! Wednesday, July 9th at 5:30 p.m.
Tuesday, June 17th at 6:30 p.m.
On May 22, 2008, more than 50 people attended the first updayton volunteer meeting held at the Cannery Art & Design Center in Dayton, OH. 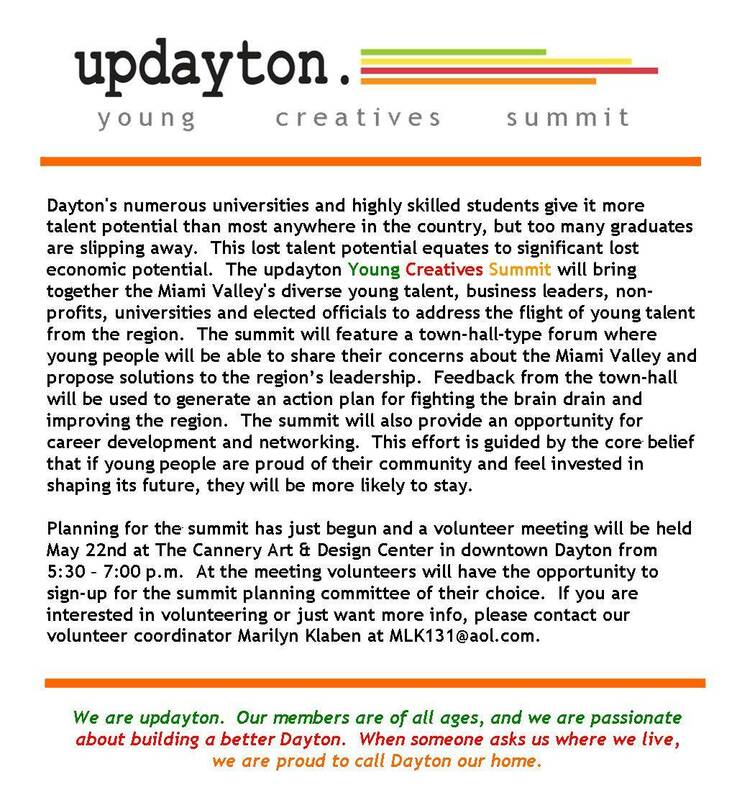 The updayton press release details the meeting: updayton-press-release-052208-volunteer-meeting.doc. Also, pictures of the event, taken by Andy Snow, can be seen here. Please distribute widely– and save the date! 1) We are meeting with other teams in the region who have young professional initiatives. 2) We have completed the business plan (which is now in the final review process). 3) We met with Summer in the City to consider a joint effort with their mentoring program. 4) Planning Committee is formulating a meeting with Volunteers. 5) We have a temporary date for the summit (currently called the Springboard Summit). 6) Developed “Talking Points” for summit team (under review). 7) Communication plan 99% complete (under review). Young talent is leaving the region and it is hurting the area’s ability to grow economically. Calculated using census data for the Dayton-Springfield MSA, the region has a 0.8 rating on the Richard Florida Brain Drain Index, meaning too many of our college graduates are leaving the region. We fundamentally believe that if the Miami Valley’s young people feel engaged civically (i.e. part of the solution) then they will be more likely to stay in the region. 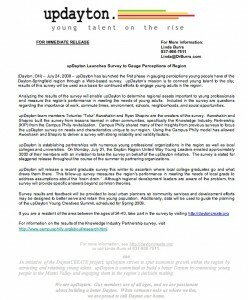 We know that several unique organizations are engaging with the area’s young talent, and the Young Creatives Summit initiative seeks to identify the common goals of these organizations in an increased collaborative effort. We believe a shared vision for the region’s future– realized in collaboration with the Miami Valley’s diverse young people, business leaders, government, universities and non-profits– will ultimately improve the economic health of the region. We propose the first annual Young Creatives Summit, which will bring together diverse young talent, business leaders, non-profits, universities and elected officials, to address the flight of young talent from the region. 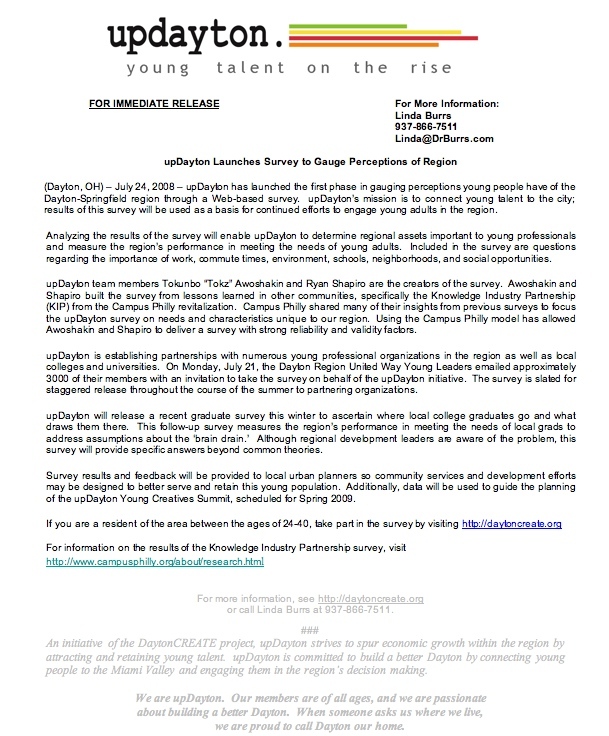 Modeled after the very successful Syracuse 40 Below (http://www.40belowsummit.com), the Young Creatives Summit will air the concerns of young people, engage them in the region’s decision making process, and help build a shared vision of how the Miami Valley can be improved. The summit will also provide an opportunity for professional development and career networking. This will be an annual event, maintaining a constant focus on attracting and retaining young talent in the region. We hope the summit will foster cooperation between the many regional stakeholders who all want young talent to stay in the region. Volunteers and potential partners are encouraged to contact Scott Murphy at 937.643.0691 or murphyjs@woh.rr.com.